NASA astronaut Mark Vande Hei is pictured working outside of the International Space Station during the last spacewalk, on Oct. 10, 2017. Two NASA astronauts will head outside the International Space Station (ISS) for a 6.5-hour spacewalk today (Oct. 20), and you can watch their entire excursion live here at Space.com. In the third spacewalk at the ISS this month, Cmdr. Randy Bresnik and flight engineer Joe Acaba will continue working on the newly installed "hand" at the end of the Canadarm2 robotic arm. They'll also replace a fuse in a two-armed robot known as "Dextre" and install a new HD camera outside the station. Today's spacewalk was originally scheduled for Oct. 18, but NASA postponed it following the delay of a Russian cargo launch. The Progress 68 cargo craft was supposed to blast off last Thursday (Oct. 12), but the launch was aborted at the last minute. The cargo mission lifted off two days later and arrived at the ISS on Monday (Oct. 16). In addition to rescheduling this third spacewalk, NASA also changed the game plan for the day, NASA officials said in a statement. Originally Bresnik and Acaba were going to finish lubricating the new latching end effector (LEE) — Canadarm2's "hand" — but that task will be deferred to a later spacewalk. Instead, the astronauts will replace a light on the new LEE. Another task that will be postponed to a later spacewalk is the replacement of an external camera at the Destiny module. That camera has been giving images a yellow hue, NASA officials said in a briefing on Oct. 2. Astronauts will still replace the failed fuse on Dextre, install a new HD camera on the Starboard 1 lower outboard truss and relocate some thermal insulation, according to the original plan for this spacewalk. This will be Bresnik's fifth spacewalk and Acaba's third. 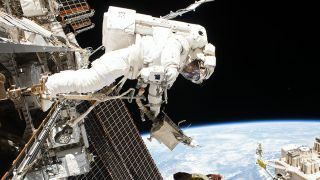 Bresnik participated in the last two spacewalks this month, together with NASA astronaut Mark Vande Hei. Acaba previously conducted two spacewalks with the space shuttle mission STS-129 in 2009.